Although there are endless combinations to mason jar salads, this Sesame Chicken Mason Jar Salad is sweet and salty and a really convenient lunchtime meal. Dressings always goes first. Adding the dressing to the bottom ensures that the salad ingredients won’t get soggy before you eat it. Protein and grains go next. These ingredients can withstand getting a little wet and placing them with the dressing allows them to marinate and soak up the flavours before eating. Then add the fixings. Vegetables, nuts, seeds, avocado and cheese go next. Add leafy greens last. Leafy greens should be added last so they are as far away from the dressing as possible. 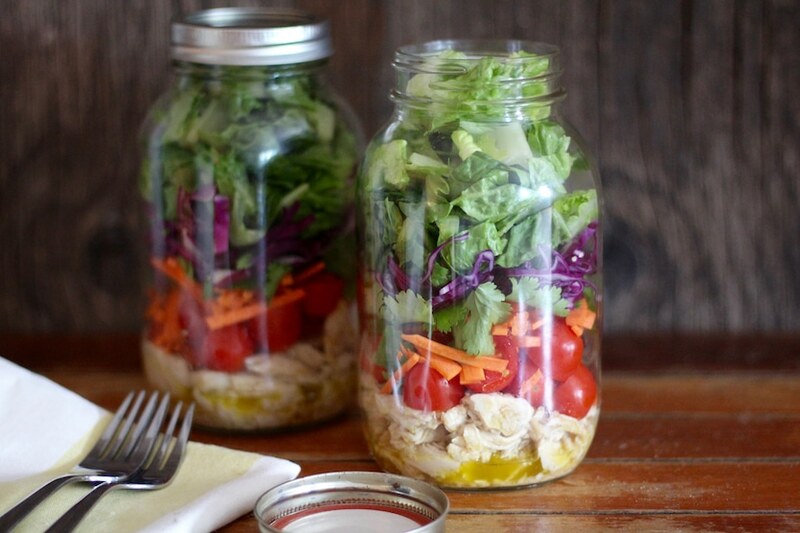 Mason jar salads make convenient office lunches as they are easy to transport and easy to eat; you can eat then directly out of the jar, or invert them directly into a bowl or plate for a perfectly layered salad. Once you’ve got the basics down, this Sesame Chicken Mason Jar Salad is just one of the many flavour options you can create. For the best salads you’ll want to use the best quality chicken, and I order all of my meat from truLOCAL as it is high qaulity local product delivered right to your door. I like to add the chicken to the bottom of the mason jar to help it marinate in the dressing before I eat it, but it can also be added to the top but it will cause the vegetables to get soggy faster. In a small bowl or jar, combine dressing ingredients and whisk well to combine. 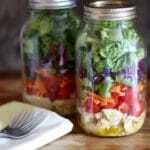 Assemble the mason jars; begin with half of the dressing mixture and add shredded chicken, cover with cherry tomatoes, shredded carrot, shredded cabbage, fresh coriander and chopped lettuce. Cover with lid and store in the fridge until needed. To serve, invert the jar into a large bowl or plate, or simply eat directly out of the jar.